MINNEAPOLIS--(BUSINESS WIRE)--May 19, 2016-- Tomorrow Select Comfort will mark a major retail milestone by opening its 500th Sleep Number® store. Located in Eden Prairie, Minn., the store features the latest store design and experience, which is interactive, educational and distinctly different than other retailers. The company's presence has evolved from a small kiosk in Rosedale mall in the Twin Cities in 1992 to a retailer with a national store footprint and products exclusively sold through Sleep Number stores and sleepnumber.com. "Opening our 500th store is a significant milestone for our company," said Andy Carlin, Select Comfort executive vice president and chief sales and services officer. "Offering customers exclusive products sold only through our company-owned stores and sleepnumber.com is an advantage unique to Sleep Number. Our retail investments over the last several years have been balanced between investing in our existing stores and adding new locations as we have developed markets across the country. Our portfolio of stores is very healthy, with the vast majority being less than five years old. The Twin Cities is our home market and with the growth of the southwestern metro area, our new Eden Prairie store is perfectly positioned to serve those customers." Investing in its retail stores has been a key priority for the company over the past five years. About half of Sleep Number stores are in non-mall locations and the other half in productive malls across the country. In 2016, the company expects to open nearly 50 net new stores. 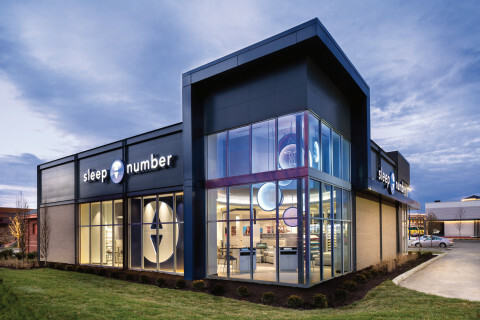 Sleep Number's retail productivity of approximately $1,000 per square foot remains top ten among U.S. specialty retailers and is driven by a differentiated store experience with a modern store design. For the second year in a row, Sleep Number was recognized with the Silver Outstanding International Store Design Award from the Association of Retail Environments. Today, Sleep Number stores redefine the mattress shopping experience, leveraging the knowledge and experience of our sleep professionals and our innovative store design. In addition to featuring a complete line of Sleep Number® beds, the stores highlight SleepIQ® technology, proprietary sensor technology that works directly with the bed's DualAir™ system to track and monitor each individual's sleep; IndividualFit® 3-D Imaging, a digital map that displays the body's pressure points; and the PillowFit® experience to help customers find a pillow that perfectly fits their needs.